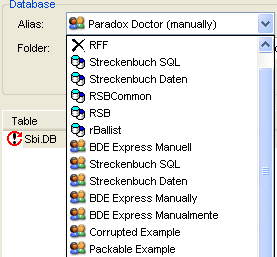 Quite a number of programs use Paradox Datenbases (*.db) to store their data. Some important Homebanking, Financal and Business Programs belong to it. A database may be damaged rapidly by a Crash, even if the harddisk contains no errors. The corresponding program may show inexplicable behaviour, false calculations or absurd results. At the worst it works not at all. It seems to be broken. Often the User makes the mistake to reinstall the whole program. But the reason is a corrupted database and not the program itself. This Maintance Program verifies table errors and repairs the database in very most cases. So it avoids loss of data, data backup or reinstalling of the whole progam. In the rare case of a totally damaged database even this program is powerless. But also now this program assists You with a detailled information wich tables are damaged. This may be helpfull as contacting the manufacturer or to backup only a part of the data. Under Windows Vista (and already on Windows XP) data not should be stored in the same folder as the program itself but in the user specific directories. "C:\Documents and Settings\[Name of the user]\My Documents\". In contrast Paradox tables of version 7 supports long filenames. 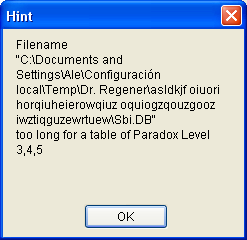 With "Paradox Doctor" you may convert outdated tables into the up-to-date Paradox 7 Format . "Paradox Doctor" supports als User alias names. These alias names are only valid for the current user and may be modified even without admin rights.